How to clean canvas boots. How to clean hiking boots. How to clean leather boots. How to clean patent leather boots. How to clean suede boots. So, cleaning boots. When researching this article, I had myriad options to choose from in style, make, and method. (Good word, myriad. On a side note, I learned recently that the word “of” is included in the definition of the word myriad, so adding it after the word is redundant. Kind of like saying “cleaning boots clean.”) I went with some of the old staples—canvas, leather and suede—and threw in a couple of fun ones: hiking boots and patent leather boots. Now why you would need patent leather boots I’m sure I don’t know. To each his own . . . 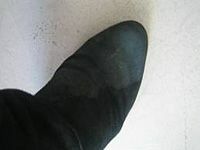 In most cases, cleaning boots is not unlike cleaning shoes, especially when dealing with like materials. If you would prefer tips and tricks on how to clean shoes, check out How to Clean Shoes, How to Clean Suede Shoes, and How to Clean White Shoes. Further, we also have an entire article about how to clean Uggs. So if that’s your flavor, check out How to Clean Uggs. Waterproof, waterproof, waterproof. You want your boots to last? Waterproof them. Especially if you live in a northern state like I do. 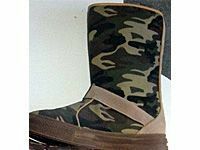 Your only other option is to not wear boots during the snow, rain, or other watery states. And who knows when and where it’s going to precipitate? The only place you can get away with not waterproofing your footwear is in San Diego, California. Do you really want to risk it? How to clean canvas boots. Cleaning canvas boots is pretty easy once you know what you’re doing. If your boots have laces, remove them. Fill a small bowl with warm water and add a mild dish soap (see the sidebar for my suggestion) and leave those laces to soak. If you have inserts, take them out now. As the boots are made from canvas (and one presumes rubber), rinse them inside and out thoroughly with warm water. Take yet another bowl and create a thick paste using warm water and baking soda. With this mixture and an old toothbrush tend to the problem areas of your boots. Don’t be afraid to use a lot of cleaner—baking soda is cheap. Rinse off again in warm water and fill them with newspaper or a shoe form and leave them to dry. You’ll want to leave them out of the sun and away from sources of intense heat lest they become stiff. Now, take your laces and lather them up good, working out as much of the dirt as you can. Rinse and lay them out as well. 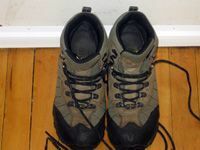 How to clean hiking boots. Okay, here goes: Remove the laces from your boots. Soak those in a mixture of dish soap and warm water. 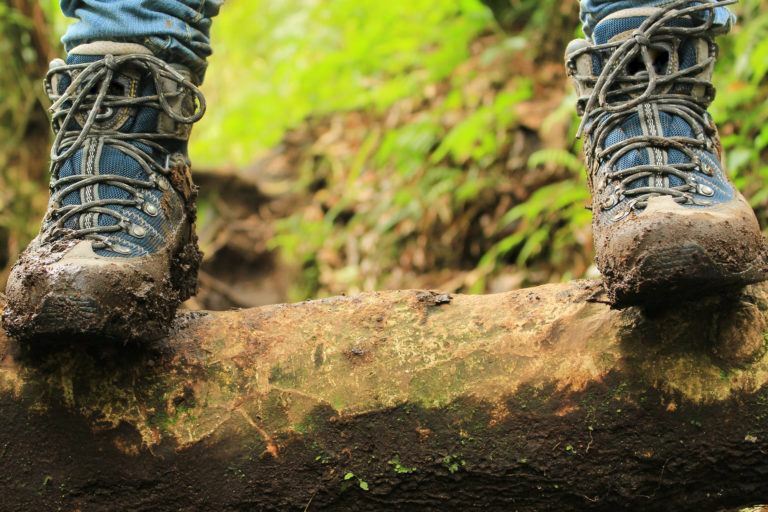 Scrape off any dried mud from the soles using something like a toothbrush handle or a stick. Wipe off any further surface dirt using cool water and a cloth. Next, take a toothbrush and dip it into the soapy water that your laces are soaking in and use it to scrub particularly dirty areas of the boots. Rinse the boots with cold water and set out to dry. It is unwise to leave them to dry next to a heat source such as a radiator or (God forbid) a hair dryer. Hand scrub the laces and rinse them off in warm water. Then lay them out to dry. How to clean leather boots. If your leather boots have laces, take ’em out first. Then, take a soft shoe or boot brush (or, in a pinch, a clean soft cloth) and go over the entire surface area of the boots to remove dust, excess dirt, and anything else you may have picked up on the way. Create a solution of mild dish soap and warm water. Dip a soft cloth into the solution and wring out the extra moisture so that the cloth is only damp. Proceed to scrub your boot, reapplying your cleaning solution frequently so to always be scrubbing with a clean section of cloth. Once you’ve done this, rinse by wiping with a clean cloth dampened with fresh water. Gently rub dry with still another clean cloth. Once that’s all done you’ll want to polish the leather so it’s all pretty again. How to clean patent leather boots. 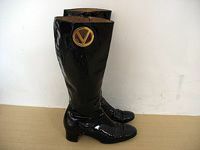 There are a number of schools of thought with regard to cleaning patent leather and just as many with regard to boots of the same. Your best bet? Go gentle or go home: Patent leather is delicate and it doesn’t take much to ruin. You can use baby wipes for a quick wash, but using a soft, lint-free cloth with gentle dish detergent (Seventh Generation would be my suggestion. It’s all natural and extremely gentle.) mixed with water is going to be the most useful. Rinse by wiping with a clean damp cloth. DO NOT submerge your patent leather. This can cause bad things to happen to your boots—including cracking, shrinkage, and terrifying brittleness. How to clean suede boots. People get all twitchy when talking about cleaning suede. My response to them is: Go into it informed and it’s really not that hard. 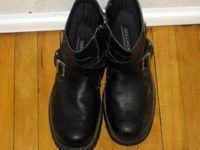 However badly your boots are soiled, let them dry completely and then rub with a clean towel or suede brush. It’s important to remember to rub in one direction only: This will remove the dirt. Your next step depends on the nature of the soiling. For scuffs you need only to go over it a few times with the suede brush rubbing back and forth (yes, this seems contradictory, but it works). For marks, you’ll have to use a suede eraser (which transfers marks from the shoe to the eraser). For water marks, dampen a cloth and wet down the entire boot. Use another cloth or sponge to remove the excess water, then stuff the boot with newspaper, tissue, or a boot-form. 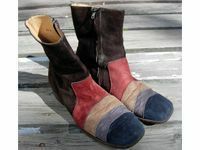 Let the boot dry in a cool, dry place away from the sun and any intense heat source (furnace vent, exhaust fans, etc.). Once dry, use your suede brush to restore the nap by brushing in one direction and reapplying suede protector. Cyndi Lauper wants you to protect your footwear. Boots are not cheap and if you insist on doing anything but leaving them on display under glass I’d suggest that after each cleaning you protect them from the elements. And I’m not just talking about rain, sleet, snow, and the dark of night (which, as it turns out, is NOT an element). The warm sunshine can be just as detrimental to your footwear as any of the rest. In the case of some leathers, it’s even worse. Don’t put it off, don’t delay, or I guarantee it will shorten the life of your boot, be they thigh-high #@$&-me boots, steel-toe work boots, or boots t’were made for walkin’. 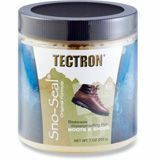 Tectron Sno-Seal Waterproofing.This stuff is made for smooth leather and although I had never heard of it before, everyone I spoke to—from the folks at three REI stores, to my mother-in-law who spends the winter chasing around sled dogs, to my local car-wash attendant—says this stuff is the absolute best. Half silicone and half beeswax, once this stuff is on your boot it is impregnable. Seventh Generation Natural Dish Liquid. 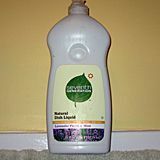 This gets recommended a lot (mostly by me), but there’s a reason: Seventh Generation is a great company and their dish soap is mild, non-abrasive, non-acidic, and made up of a natural formula that’s good for the environment (and it cleans dishes!). Throw in blonde hair and a passive aggressive temperament and you have a Minnesotan stereotype. Mink oil. Nothing protects like the rendered fat of dead animals! That sounds harsh, but it’s true. Mink oil, when applied to leather, will protect your boots and help resist water, dirt, and other hazardous substances involved in going outside. It’s kind of gross to work with, but once you brace your gag reflex, it’s not too bad. 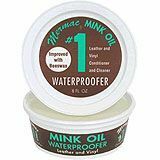 You can get SofSole Mink Oil from Amazon.